When I approach an analysis I perform the same initial steps to shed light on the system under examination. The first step is to review the master boot record and the second step is to obtain general information about the operating system and its configuration. The impact of the information on a digital forensic analysis can be significant. Quick note before anyone takes the time to read further. My post doesn’t offer any new information. The registry keys referenced are well documented and the automation of Regripper is not new. I find it helpful to see how other analysts use tools and I thought others may feel the same way. My post demonstrates how Regripper can be automated in a batch file to reveal general information about a system; thereby saving some time when completing the information gathering examination step. RegRipper is an open source tool for extracting data stored in the registry. When reviewing Regripper’s output I reference a document I created (outlines various artifacts) which allows me to see the data from registry keys in a specific order. I never thought twice about reviewing the output like this since I was only getting the initial information about the operating system. A couple of weeks ago I was going through Regripper reports when it dawned on me that I should automate the process. Create one report showing the information from the registry keys in a specific order. I wrote a small batch script to automate the creation of the operating system information report. If you just want the script then use the link at the end of the post. Otherwise, you can keep reading to see my thought process of how I put the script together before checking out the file. The script organizes information into the following five categories: general operating system information, user information, software information, networking information, and storage locations. Putting the batch file together was fairly simple since I already outlined the order of the information I wanted presented and Regripper had plug-ins to extract the data from the registry. The batch file repeats the following three lines for each Regripper plugin to create one report about the operating system and how it’s configured. The two lines starting with echo are for formatting purposes. The echo: inserts a blank line in the operating_system_information.txt while the other echo command inserts a line of dots to separate each Regripper plug-in. Rip.exe is the commandline version of Regripper and there are two options. The –r specifies the registry hive and –p specifies the plug-in to run. 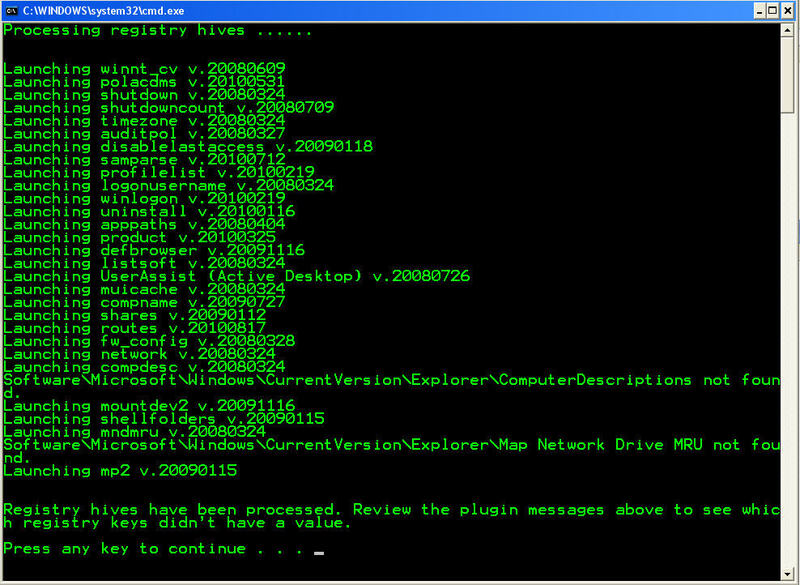 The variable %regpath% gets populated with a prompt for the folder path containing the registry hives. The batch file gets put in the Regripper folder and gets executed by double clicking the file. Three screenshots show the script against an image mounted with FTK imager. The information in the report doesn’t include everything that I’d want to know over the span of an examination but it does provide the initial information about the operating system and how it’s configured. 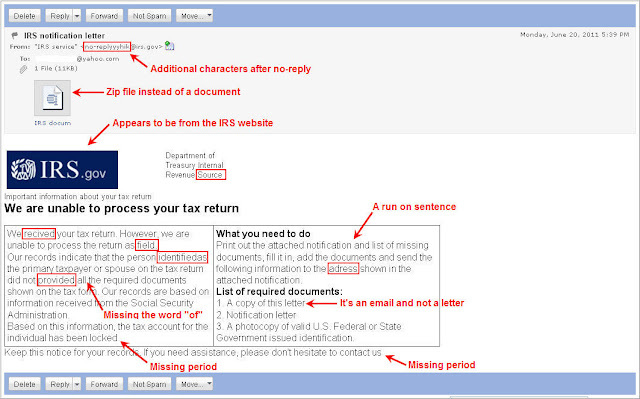 Automating the process makes me a little bit more efficient when I’m completing the examination step. I uploaded the batch file to the jIIr Google site and the file can be downloaded here (to execute the file change the file extension from txt to bat). A forensicator lives on the 10th floor of a building. Every morning he rides down the elevator to the ground floor and leaves the building to go to his forensic lab. Every night he comes home after spending the day finding evil and gets on the elevator. If it was raining then he takes the elevator to the 10th floor. If the weather is good then he takes the elevator to the 7th floor and walks to the 10th floor using the stairs. Why does he do this? The forensicator in the elevator is an analogy to a malware infected system. Trying to answer the above riddle cannot be done without looking at the man in his environment (the building). Picturing the forensicator in the building and everything that is in the elevator will shed light on to question of why he takes the stairs. This is similar to answering the question of how malware infected a system. The question can’t be answered without looking at the malware in its environment (the affected system) and examining the other activity on the system around the time the malware appeared. Take the antivirus write-ups as an example. The majority of the write-ups (I’ve read) analyze the malware outside of the environment where it was located. As a result, the write-ups provide vague information on the initial infection vector used such as the statement “distributed through spam campaigns and drive-by downloads, though given its versatility, other vectors may also be utilized”. The description doesn’t shed much light on how a specific system became infected since pretty much all of the bases are covered (SPAM, drive-bys, or some other method). If you have ever wondered what the artifacts are of malware being delivered through SPAM then the rest of this article will be of interest. Someone was nice enough to send me a SPAM email last month (sarcasm doesn’t come off the some way as the spoken word). The SPAM was a mass mailing so I was probably just one recipient out of thousands but at least the email gave me something to analyze. The examination of this email will first explain the user’s actions followed by the DFIR practitioner’s examination. The user fires up a web browser to check their email. Internet Explorer loads the home page before the user navigates to Yahoo email. A few emails are checked before the user comes across the message below. The user overlooks the indications that the email is SPAM such as the misspellings, punctuation errors, and even a run-on sentence (see the picture below to see what was missed). They proceed to read the notification letter alerting them to some kind of issue with their tax return. The forensicator was slowly making their way through a system timeline when there was activity involving Internet Explorer. There were modifications made to few Internet Explorer folders in the Administrator user account’s profile and the user account visited a Microsoft’s webpage. After weeding through all of the web activity related to the Microsoft webpage he noticed the user went to Yahoo’s webpage and accessed their webmail. The browser history and cache showed that the user spent some time using Yahoo email. Worried there might be an issue with their tax return the user decides to open the email attachment. The user felt more comfortable opening the attachment since Norton Antivirus indicated it was virus free. The attachment doesn’t initially open a document but instead opens a new window showing a file with the name IRS document.exe. Even though file extensions weren’t hidden by Windows Explorer the user didn’t notice the exe extension since they were too distracted worrying about not receiving their tax refund. The Internet activity indicated the user was still accessing their Yahoo email when an entry at 06/20/2011 22:10:00 showed the user downloading a zip file. The file IRS%20document.zip was created in the folder \Documents and Settings\Administrator\Local Settings\Temporary Internet Files\Content.IE5\M20M2OXX\ one second after the browser entry made a reference to a zip file in Yahoo email. The user double clicks the file named “IRS document.exe” thinking the file contains the list of missing documents but nothing visually occurs. A document doesn’t open, no error messages popup, and the list of missing documents isn’t shown. The user closes the attachment’s Explorer window at 06/20/2011 10:22 and continues surfing the Internet. This is the point in the story where the user perspective ends. The story tried to illustrate how someone could be tricked into opening the attachment in the SPAM email. The forensicator continued to work his timeline when there was a flurry of activity involving executables. The first artifact was a prefetch file for a program - IRS document.exe - (MD5 hash 77065d6545b0226ccf66ce75d5254bfa and link to the VirusTotal report) that was the executable inside of the zip attachment. 10 seconds later the Windows svchost.exe executable ran before two additional malware were dropped on the system. The malware was PUSK3_~1.EXE (MD5 hash 541c25d26e8b1eb2d1a35cd52854650f and link to the VirusTotal report) and tmp75D5.tmp (MD5 hash 4bda47a91bea4ceccc6003a46aeb754d and link to the VirusTotal report). 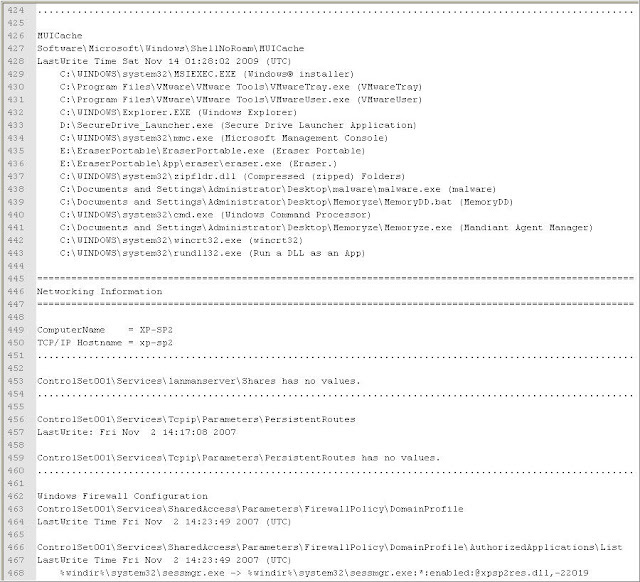 The executable activity is shown in the picture below. The forensicator tied the execution of the IRS document.exe and pusk3.exe to the administrator account by finding the following information in the account’s MUICache registry key. The last artifact pointing to a zip file occurred at 06/20/2011 10:22 and it was modifications being made to the HCU\Software\Microsoft\Windows\ShellNoRoam\BagMRU registry key. A summary of the information in the BagMRU registry key is provided below. The artifacts of malware being delivered through SPAM consisted of a user accessing email and opening a file around the same time. These artifacts hold true for malware being delivered via email even if the circumstances are different. At one point I examined an infected system which didn’t involve the IRS notification letter SPAM or web email. The activity on the system showed emails were assessed around the time a zip file was opened which happened just before the first piece of malware appeared on the system. All of the activity (and lack of other activity such as a drive-by download) lead me to conclude the malware was the result of a malicious email attachment. The specific artifacts in the examination varied slightly compared to what was discussed in this article but the general overall artifacts (email and file access prior to malware appearing) remained consistent. Only examining malware from a system may not indicate email was the vehicle used deliver it. This is similar to antivirus write-ups about the analysis of malware which leave out information about how a specific computer became infected. The same line of thinking applies to the well known but slightly modified riddle at the beginning of the post. The riddle can’t be answered by solely analyzing the man outside of his building. Sure the analysis will reveal a lot of information about the man but it won’t explain why he is on the 7th floor of his building. The man needs to be analyzed in his building and the activity that occurred prior to him reaching the 7th floor should be reviewed. Trying to solve the riddle in this manner will reveal the answer of why he walks the stairs from the 7th to the 10th floor. The guy is too short to press the 10th floor elevator button and the highest he can reach - without an umbrella - is the 7th floor button. Like the man in the riddle, the activity on a system preceding the malware should be analyzed to determine if an email, drive-by, or some other means was used for the delivery. Search engines are not only great tools for locating information across the Internet but they can alert organizations of potential security incidents. Others have already published methods on how to use search engines to locate information including web pages infected with SPAM links and common vulnerabilities. In addition to this information, search engines can help determine if a company's data has been stolen. Google queries and alerts can be leverage to assist organizations with noticing security issues such as data leakage, website vulnerabilities, and stolen information. This post will discuss an approach of using Google to search and monitor portions of the Internet for specific security issues. The term Google hacking refers to when search engine - such as Google - is used to locate weaknesses on the Internet. This is accomplished by building queries a specific way to locate sites containing software vulnerabilities, misconfigurations, or sensitive information. The same technique can be used by organizations to identify security issues on their own websites. What the specific issues are will be dependent on the organization but two possibilities are sensitive information and infected web pages. The business dictionary defines sensitive information as any information if compromised “could cause serious harm to the organization owning it”. Numerous types of data fit into this definition but three examples are: personally identifiable information (PII), credit card information, and network information. PII can uniquely identify or locate a single person, and PII includes social security numbers, date of births, and addresses. A data breach from a few months ago illustrates the risk of PII being compromised. The personal information (names and social security numbers) of 300,000 people who applied for California workers' compensation benefits were mistakenly exposed online. As reported, the compromised PII was discovered last month after a data security company located the data through automated Google searching. The combination of breaches being reported in the media and the various data breach notification laws, it stands to reason that organizations should monitor their Internet facing sites for exposed PII. The Google queries below may locate information for social security numbers, birthdays, or contact information for specific websites. The above queries contain a few symbols needing explnations. The pipe symbol ( | ) means “or” and the query will return hits if either term is present. The quotes ( “” ) mean the string of words has to match exactly while the asterisk symbol ( * ) is a wildcard and can represent any unknown terms. Site: makes Google only search the websites containing the specified domain (the query would contain the organization’s domain instead of “domain-name-here”). For additional information on syntax for Google queries check out Basic Search Help and More Search Help. The company Blippy exposed data containing credit card numbers to the Internet. A few months later a company discovered the credit card numbers of four Blippy's users were in Google's index. In addition to PII, organizations could monitor their Internet facing websites for data related to credit card information. The Google queries below may locate information related to credit cards and amongst the information could be card numbers. Sosata.com (a Groupon subsidiary) accidently published a database containing email addresses and plain-text passwords of 300,000 users which was then indexed by Google. The accident was discovered after a security consultant located the exposed information on Google. Network information such as passwords, usernames, login pages, and errors can assist outside parties in attacking an organization. Companies can monitor their websites for leaked network information that may pose a risk to their network security. The Google queries below may locate: login pages, usernames, passwords, and errors. The University of Calgary’s website was compromised and the attackers used the website to help sell pharmacy products. The Sucuri Research blog performed a Google search against the university’s website and was able to identify more than two thousand infected web pages. The compromise illustrates the point made by Unmask Parasites which was “to make their doorway pages rank better in search engines, spammers search for compromised web sites and use various security holes to insert hundreds of hidden spam links into trusted web pages”. Companies should add infected web pages to the list of what to monitor on their websites. Google queries can identify infected web pages. The Unmask Parasites blog has a list of queries which can be used as a starting point for searching for SPAM links. In addition to the Unmask Parasites list, additional terms can be identified by using the blog’s Find Infected Pages with Google to locate infected web pages on the Internet. The portion of the infected web page displayed by Google can reveal other terms to use in a SPAM link query. The picture below shows an infected web page with the search terms used highlighted in bold. The previous Google queries can help organizations identify sensitive information and infected web pages on their own websites. However, the queries won’t alert an organization to a compromise resulting in company information being stolen. A Naked Security article reported how the Atlanta Infragard chapter was compromised and the attackers “published 180 usernames, hashed passwords, plain text passwords, real names and email addresses”. How can a company feel confident that none of their employees’ information was compromised? Applying the same question to the publicize data breaches over the past year makes it even more difficult for a company to know if they are at risk. Google searches can help by querying the websites where stolen information is published. The plus symbol ( + ) attached to the domain name makes Google match the domain exactly as it is typed. Pastebin is one example of a website to search but other sites, such as forums, should be queried as well. 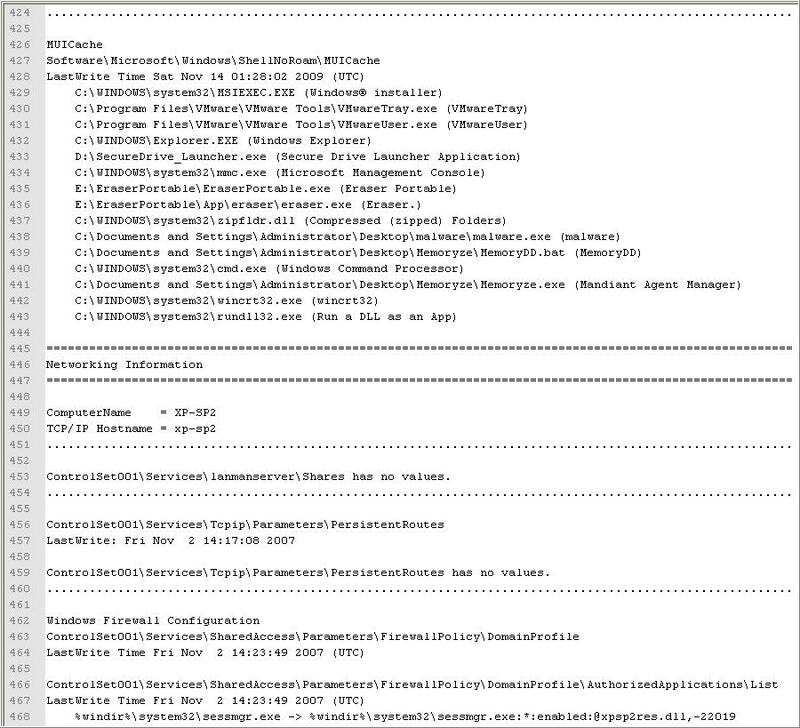 A few other potential websites to search are mentioned in Lenny’s post Using Pastebin Sites for Pen Testing Reconnaissance. The previous Google queries will identify sensitive information, infected web pages, and stolen information currently in Google’s index or cache. To continuously monitor the Internet for this type of information an organization would need to periodically perform the queries to see if new information was added to Google’s index. Google alerts send email updates of the latest Google results based on the specified query and the alerts can hep organizations with the continuous monitoring. All of the previous queries can be configured as alerts and it's a fairly simple process to setup it up as can be seen in the screenshot below. 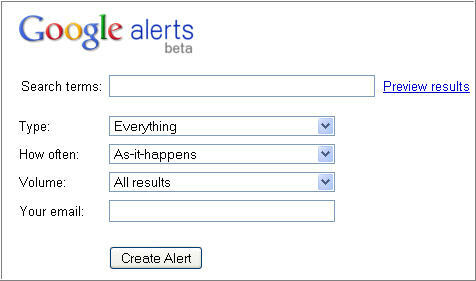 There are five required fields in setting up an alert. Google queries show the information currently in Google’s index and cache while Google alerts send email notifications when Google is returning new information. The combination of queries and alerts can be leverage by organizations to identify security issues such as data leakage, website vulnerabilities, and stolen information. The majority of the data breaches referenced had two things in common. The first commonality was sensitive company information was exposed to the Internet. The second commonality was the companies were notified about the data leakage after a third party located the information through Google searches. The approach of using Google to search and monitor portions of the Internet won’t prevent security issues from occurring in the first place. However, the approach may reduce the amount of time that lapses before an organization knows about the security issue. My hope is at least a few people / organizations find this post helpful. It wasn’t my plan to write about the leakage of sensitive information (actually I was working on my next post Examination of a Phishing Email) but I wanted to inform others about the risk of leaked information. Some of the queries I mentioned were obtained from the book Google Hacking for Penetration Testers and the Google Hacking Database.